Chairman Choi Sung-Rak (center) of WaterROK poses with General Manger Bernhard Brender (left) of Grand Hilton Hotel at the hotel on July 14, 2017. Chairman Choi Sung-Rak of WaterROK, a premium water brand in South Korea, has recently appointed General Manger Bernhard Brender of Grand Hilton Hotel in Seoul as WaterROK's good will ambassador. Brender will also function as WaterROK's global advisor as well. The appointment ceremony was held at the hotel in western Seoul on July 14, 2017 with a dozen of high-profile personalities participating. 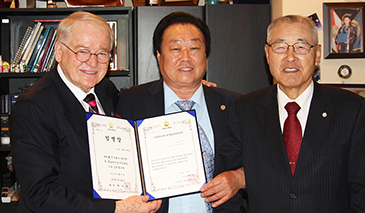 During the ceremony Brender also received a gold medal from the Jang Young-Shil Science Foundation. The German hotelier was praised for his dedicated service to the needy and poor neighbors in South Korea. Among the participants was Uli Stielike, who served as head coach of South Korea's National Soccer Team for over three years. Stielike, a close friend of Brender, greeted each one of the participants in the ceremony. Among about hundreds of drinking water brands in South Korea WaterROK is the only top spring drinking water brand developed by its Chairman and CEO Choi Sung-Rak. He found the water source in a hot spring in South Jello Province's Jangsung Country a couple year ago.